Our tried and tested digital transformation framework coupled with our marketing methodology is the secret behind our long list of satisfied clients! At solomoIT we have been providing holistic digital transformation solutions to small and medium businesses in Australia, specifically Melbourne and Sydney! Our digital strategy based on our decade long experience is laser targeted towards generating measurable results that add value for our clients and their customers. solomoIT's Digital Transformation Framework is based upon 4 key elements to deliver exceptional customer experience. 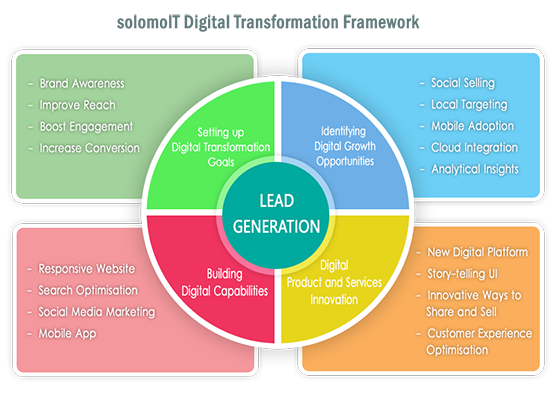 The following model explains how solomoIT's seasoned Digital Marketing, Digital Branding and Responsive Web Development teams work together to drive greater ROI and generate more meaningful leads for our clients. 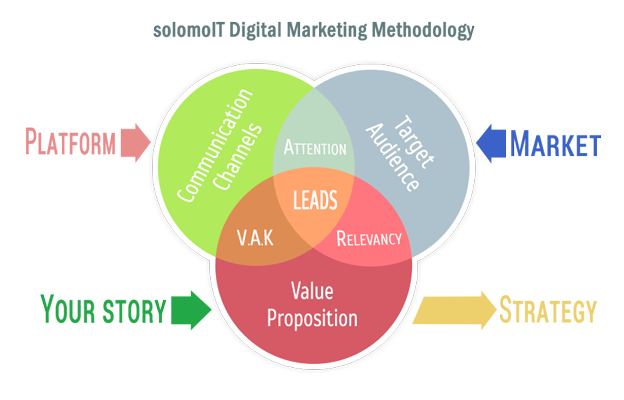 Our methodology combines all three elements to develop a holistic digital marketing strategy based upon our client's precise growth objectives. At solomoIT, we provide Digital Transformation Consulting and work closely with small to medium businesses to understand their brand values, their target market and their offering to create outstanding web experiences and digital marketing campaigns for their audience!